This is another example of what we call "Tenting"; isolating the water damaged areas from the unaffected areas. In this case, we were able to dry the sheetrock efficiently and prevent extensive demolition and cleanup. The overall process was completed in five days, allowing the business to begin using that area again. When drying a large structure that may only have minor areas affected by water damage, rather than the entire building or room, it may be necessary to employ a tactic we call "Tenting". The purpose of tenting is to isolate the affected area from the unaffected area to narrow our focus to only the areas that need drying. Tenting allows us to efficiently dry building materials without having to remove affected materials, thus making it easier to return the structure to preloss conditions. With over 200 pieces of drying equipment, SERVPRO of Pflugerville is ready to take on any commercial, or residential, water and fire losses in the greater Austin area. We keep our trucks stocked with any and all necessary equipment to restore your home or business in a timely manner 24 hours a day, 7 days a week, 365 days a year. At SERVPRO of Pflugerville we like to give back to the community, by sponsoring local events. The Pflugerville Education Foundation is a great local organization that provides resources to help students reach their full potential. Not only does SERVPRO of Pflugerville provide emergency water and fire mitigation services, but we care for our community as well. 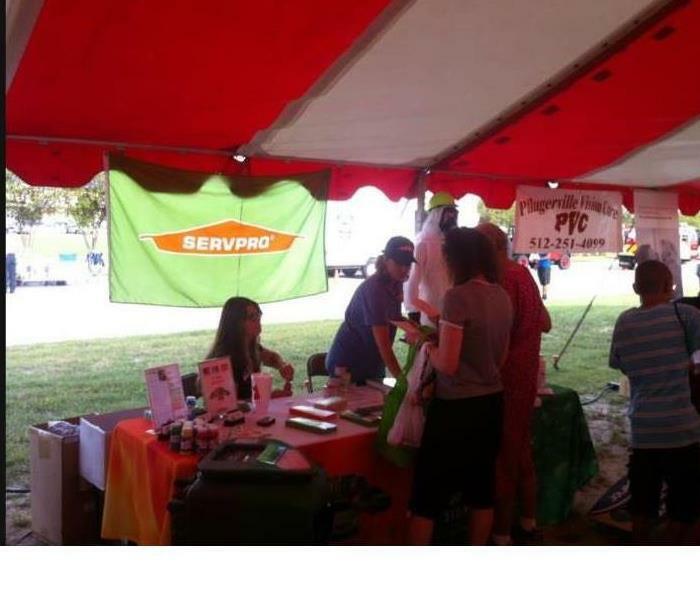 SERVPRO of Pflugerville has sponsored several community events throughout Pflugerville and the greater Austin area to educate homeowners and give back to the community. During the aftermath of Hurricane Harvey, SERVPRO of Pflugerville responded to a commercial water loss in Corpus Christi, Texas. An apartment complex suffered substantial wind and water damage, resulting in damaged roofs, and even some of the brick walls collapsing. SERVPRO of Pflugerville responded the next day and began to provide emergency water mitigation services and provide supplemental power so that the apartments could continue to operate and provide for their tenants.